Adding SharePoint licenses to Office 365 can be a bit tricky. If you add the E3 license, you get EVERYTHING that comes with E3, if that’s what you need, great, but what if you ONLY want SharePoint, and not Lync, email, etc?? I ran into this recently and used a few resources to come up with a script. As was some script work by an awesome guy I work with named Chris. You have to do it subtractively. You’ve just assigned a B and D license, when you only wanted to assign a B license. Now you see the issue…. The solution is not too hard – we can pull a list of all options available, remove the one we want, and then build the disable list from that. This way we won’t get caught when Microsoft springs options EFGHI on us. The full script is below. #use at your own risk, while this has worked for me, you should always test in a test environment and understand what it is the script is doing before using it. $userlist = get-content -path "$path\$importfilename"
#note the continue statement on next line, this skips the rest of the loop if the user is not found. Write-host "User $upn has $LicenseType License, adding $SubLicense SubLicense"
write-host "User $upn does not have a license for $LicenseType adding now"
## it returns true if the user has this license, and false if they do not. $Subject = "Important: Temporary password for your SharePoint Online Account"
$body = "Hello, <br/><br/> You've just been granted a license for SharePoint Online.<br/><br/>"
$body += "Your user ID is <b>$upn</b> and your Temporary Password is <b>$TempPassword</b><br/>"
$body += "Please log on to <a href='http://portal.office.com'>http://portal.office.com</a> <b>right now</b> and change the temporary password above to one you'll remember.<br/><br/>"
Write-host "Email sent to $upn with $tempPassword"
#start password with an alphabetical letter. #now add 14 random chars from the combined set. $Subject = "Missing users in last license assignment"
$body = $script:MissingUsers -join "<br/>"
write-host "Sending email of missing users to $to"
Write-host "Missing user email sent to $to"
main #call main procedure, this line must be the very last line in the file. We use ShareGate to migrate content. We recently started using ShareGate to migrate content from On Premise to SharePoint Online. When I did this, I found that one of our domain’s users kept showing up as errors in ShareGate – it said it could not find the user in SharePoint Online. ShareGate has a nice feature for mapping users from one system to users in another – but doing this manually to any scale would be pretty time consuming. Thankfully, ShareGate lets us save the mappings, which are just XML files with a .sgum file extension. Wouldn’t it be great if there was a way to automate creating a mapping file like this for everyone in the domain at once? Have a look at the script below, it pulls all the user accounts from an OU in AD, then looks up each user to find them in MSOL (Office 365 Azure AD) Then grabs the o365 display name and makes the mapping . Any user not found is logged so it can be dealt with separately. The whole thing is written out as a complete .sgum file, ready to import into ShareGate the next time you migrate! Note I didn’t figure out the XML stuff in a vacuum – I found an article on powershellmagazine.com to be very helpful and noted it in the script. $users = get-aduser -server server.domain.com -filter * -searchbase "OU=Users,DC=server,DC=domain,DC=COM"
$dt = get-date -format "yyyyMMdd"
Søren Nielsen did a great job in the above article and there are some useful nuggets in the comments of his blog as well. 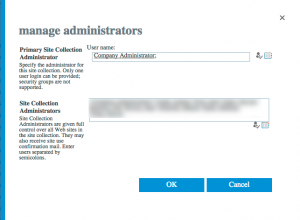 In SharePoint online (at least as of early 2015) site collection administrators have to be granted on a site by site basis. But there is a downside, you can’t “select all” on all your site collections and add a user to all site collections at once. Now, I hear you saying “Jack: What if I have 500 site collections and we add a new member to our team?” There’s got to be a better way, right? And it turns out, there is. A Quick note before we get to the script: You’ll need the SharePoint Online Management Shell installed on your PC before this will work. Admin site URL ($adminurl), and the $username that has permissions to log into the admin site url to make the change. When you run the script it will try to logon to your SPO account and will prompt you for your SPO password, then you should see some slow and steady progress as it runs through each site collection. Finally, at the end you can review the log file to see if there were any issues. 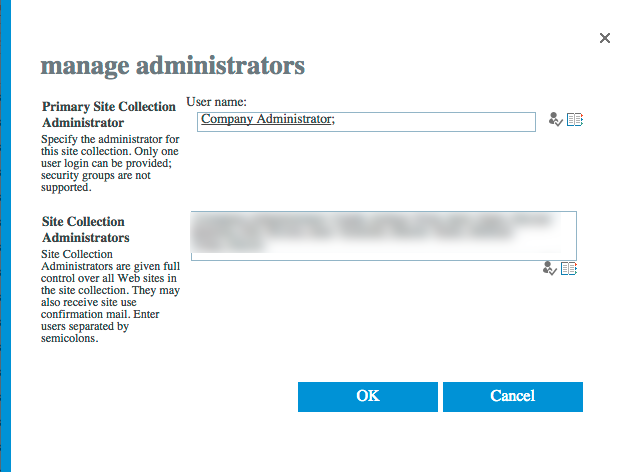 write-host "This will connect to SharePoint Online"
Write-host "Adding $user to $($site.URL) as a user..."
write-host "Setting up $user as a site collection admin on $($site.url)..."